"I'm self taught, stubborn and I won't stop until I like it." That's how Clarke Titus of Rough South Home summed up his relatively new career as a furniture designer and builder. For years, he's gone to salvage yards and forest-free lumber yards and has created some truly incredible pieces of furniture. He's dabbled as a golf pro, a cook and a writer but always came back to his workshop to take something unexpected and turn it into something cool. He just has a knack for it. This year, Clarke is hunkering down and trying something new by introducing his first furniture line based on his best designs. The pieces will remain the same, but the materials will shift, depending on what's available. 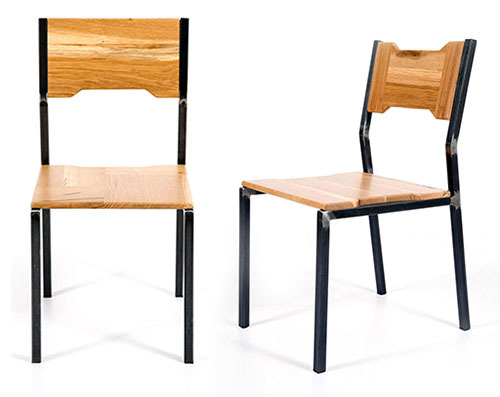 This first batch highlights Eutree eco-friendly white oak with natural oil rubbed steel. This table is just stunning in person. 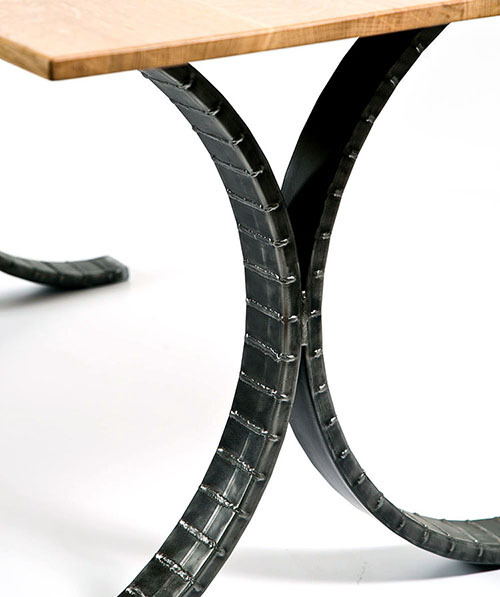 It's the Circle Base Dining Table- Clarke's take on a circle base, but with a rectangular stock kerf-cut that is bent and re-welded for texture and sturdiness. Clarke explains the unusual process in crafting the legs, which was completed by welder, Ben Vass. Clarke, "Each line was cut which then had to be filled with a weld. It's super intricate and it took forever, but it was the only way to make those legs strong and stable with the tools available. I was pumped that I kept pushing that design until it submitted." 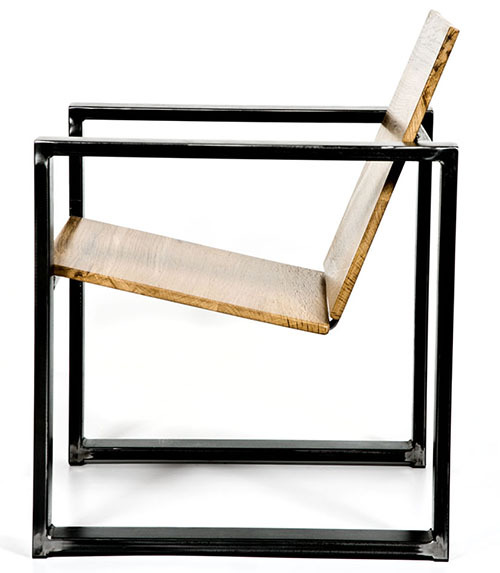 What sets Clarke apart from most furniture makers is his obsession with wood grain. He'll spend hours, often days figuring out which cuts go where then pay just as much attention mixing the perfect stain. Clarke, "It's obvious when it's the wrong combination. But when it's right, it's easy and calm. You can't turn a piece into something it's not. It'll feel forced." I think my favorite trait in any artist (or person for that matter) is the ability to embrace imperfections. Clarke relishes any changes or mishaps in the wood and lets them shine. 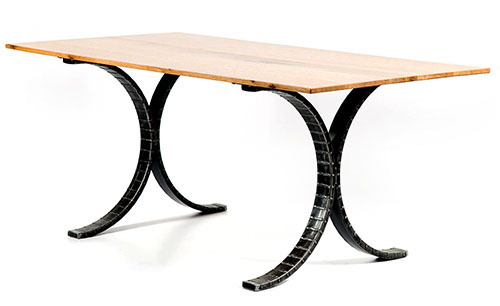 In this coffee table, metal was imbedded into the tree causing mineral stains, which in oak, turns the wood to black. Clarke, "You couldn't really use it for flooring (basically it's trash) but I love it. I left the holes so if you look at the table in person and know what you are looking for, you can see the unfilled holes in the middle of those black patches." Clarke's Summer 2014 line includes tables, chairs, benches and a light sconce. After this batch, he'll begin another using different domestic hardwoods like walnut, cherry and maple. All wood will be forest-free and hand picked by Clarke himself. All the pieces will be hand numbered and signed by Clarke. Although part of a continuous ever-changing line, these creations are one-of-a-kind with a good story to tell. Just ask him.